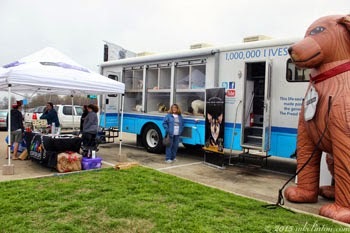 On March 26, 2015, the North Shore Animal League Tour for Life pulled into our town. 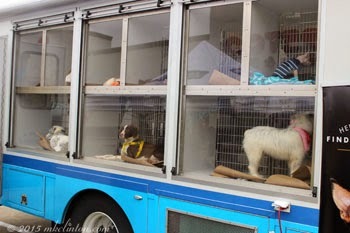 They stopped by the Humane Society of Northwest Louisiana (HSNWLA) to pick up some dogs and drove them in their awesome mobile adoption center to our local Petco parking lot. The HSNWLA was the partner shelter. Many of our other local rescues and eager residents looking to adopt a new best friend were there. It was a terrific day to adopt a pet in Shreveport! We went to see this marvelous organization in person. They do an incredible job across the country to raise awareness for pet adoptions. 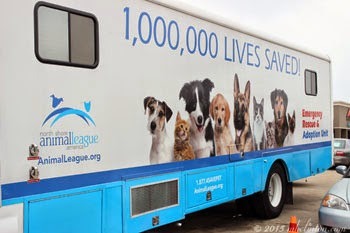 This year the four mobile units will log over 17,000 miles helping shelters. The North Shore Animal League has saved the lives of over 1 million pets and they aren’t stopping there! Be sure to check for a location near you. There were so many adorable dogs and puppies that it was hard to resist taking one home. Luckily, at least thirty people were unable to resist and found their new best friends during the event. The HSNWLA offers a way for people that want to help, but can’t adopt a dog. You can be a “Happy Dog” sponsor for only $25 a month. That tax- deductible donation will be used for vetting costs including vaccinations, heartworm testing, and preventative along with spaying/neutering. You will receive a photo and adoption updates on your pup. Most importantly, you’ll be helping a great organization. Here are two awesome HSNWLA dogs looking for their forever home. Please share Roxy and Noah on your social media and let’s find their best friend. Our Tuesdays are special, because we join Dogs ‘n Pawz and Talking Dogs as they host Tuesday’s Tails. 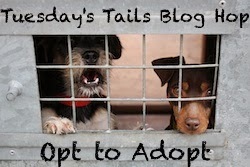 This blog hop features shelter pets from around the globe that need forever homes. Please visit and share these deserving dogs and cats on social media. These sweet dogs are available through the Humane Society of NW LA. Very cool, what a fun day. Hope they all find a home soon. Love the North Shore Animal League! Sharing. What a great event and way to go to those who found new forever homes. Have a terrific Tuesday. What an amazing event! 30 adoptions in a day is great! Fantastic!!! Thanks for sharing this! That is great! We wish there were more people who wanted to adopt than there were candidates! It sounds like the event was pretty successful. Thanks for shairng. Thanks for the Mewz about the NSAL van - what terrific day! Love and support NSAL as often as possible. Gosh, I remember North Shore Animal League from way back when I was in high school. They and Best Friends Animal Society had my attention even back then. It's so great to know rescues like this are still going strong and doing more than ever now. That's awesome that they do that; I've heard about some of the great work they've done over the years and it's really inspirational. It's so lovely that they can get out there for people to come and see their animals; a lot of us work and don't live near a shelter, it's such a practical idea. Love it. Noah and Roxie are adorable and North Shore Animal League is awesome! Thanks for sharing and we are off to share those two precious pups!